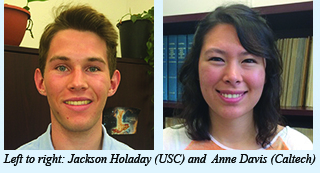 Carnegie is hosting two EFree-supported undergraduate interns this summer. Jackson Holaday is an student at the University of Southern California. He is returning for his second summer to work with Tim Strobel. He is assisting with the installation of a Paris-Edinburgh press. Also working with Tim is Anne Davis from Caltech. She working on the synthesis and characterization of new potentail solar energy materials using high pressure-high temperature methods.